Another weekend that seems to have flown by but it was filled with a lot of goodness so I can’t complain. I got to see my dear friend Christine and her husband. We had a yummy dinner, great conversation and it was just so nice to be able to spend time together. 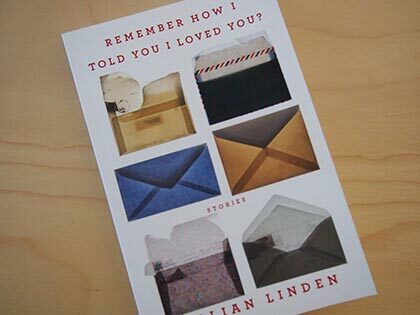 They also gifted me with a signed copy of Remember How I Told You I Loved You by Gillian Linden. Aren’t my friends the best? The Panda Theory by Pascal Garnier. A French noir book from Gallic Books. I also got Perfect Timing by Laura Spinella which sounds like a good love story. The other book is There Is A God! by Richard Smith and Maureen McElheron which has 1,001 heartwarming (and hilarious) reasons to believe. Not necessarily something I would pick up but this might be kind of a fun read and I like that they used an exclamation point in the title. Finally The Vintage Teacup Club by Vanessa Greene. Ah perfect timing as I was just talking about drinking tea in my last post. 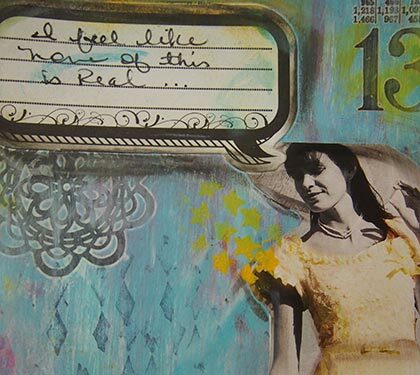 I also got to play in my art journal a little bit. I took the image of the girl from a Europa Editions catalog. I also happened to be listening to Camera Obscura and I just took some of the lyrics from their song Forest and Sands and switched it to “I” for my page. I feel like my page still needs something but I’ll have to go back to it another time and see what I think. Finally the day was sunny and beautiful so we took our bikes to the veloway for three rounds. I’m loving my new bike. So the one thing I didn’t get to do was catch up on my blog reading. I hope you guys have been having a wonderful weekend. Now, I need to go check out my shelves and find a scary read so I can complete my R.I.P. challenge. You have to enjoy the cool days while you can! Enjoy the outdoors. We don’t have a good place to ride bikes where I live, but I do love to ride. Anytime we go on vacation and can rent them, we do. It sounds like you had a great (busy) weekend. Let us know what your next RIP selection is going to be! We still have another week of October spookiness. Sounds like an absolutely lovely and perfect weekend! I hope you guys are having the same lovely weather that we are (though I do wish the sun would peek out this morning so I could take a walk with the babe). The journal looks beautiful. I keep thinking that I’ll start jotting down things in mine but time always seems to get away. Have you ever written a post about when you journal? Would love to hear! I love reading your posts. They’re also so happy. The feeling is contagious. 🙂 I’m with Trish, I would love to read a post about your journals. Didn’t you do that before? It sounds like you had a great weekend! I’m looking forward now that my kids are getting older to taking them out on long bike rides. Such fun and good exercise at the same time! I hope you have a great week as well! Sounds like you had a lovely weekend. Happy reading! The Vintage Teacup Club sounds especially good. 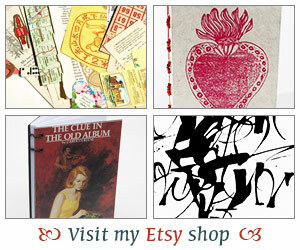 Your journals are lovely! Isabel – It’s been beautiful lately! I love it and wish it was like this all the time. Hope you’ve been having some great weather too! Sandy – It’s taken me a while to really enjoy bike riding and I feel like I’m still learning. My husband is an avid cyclist – we only have one car! So he’s happy I’m finally learning to love bike riding! Vasilly – Aw thank you! I think there are so many sad things going on in the world so I try to focus on the good stuff that happens. I’ll try to do a post on just journaling! Samantha – That’s a great idea. I’m trying to come up with different places I can ride my bike to. I get very intimidated by traffic still but luckily in Austin we are seeing more cyclists around and more bike lanes so I’m happy about that. Bookworm – Doesn’t that book sound good? Like a good comfort read!